First off, a disclaimer: this is not meant to be an end all and be all of Malaysian food. 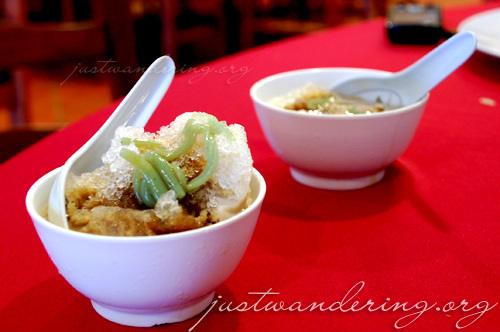 The food and restaurants featured in this post are a small sampling of Malaysian cuisine. And of course, these are my favorites. I have to admit that I have never really been adventurous when it comes to food. Sure, I’ll try the weird stuff, but not when I’m alone. So when I’m off wandering solo, I’d usually stick to the familiar, and steer clear of anything that looks spicy, which is a hindrance since a lot of Southeast Asian nations have a penchant for chili. Thanks to Marie, our tour guide, we were enlightened to the wonders of Malaysian food. Now I know what to order next time I find myself back in Malaysia. After our first full day in Malaysia, Marie, our tour guide asked us where we want to have dinner. Ivan was quick to request for bak kut teh. 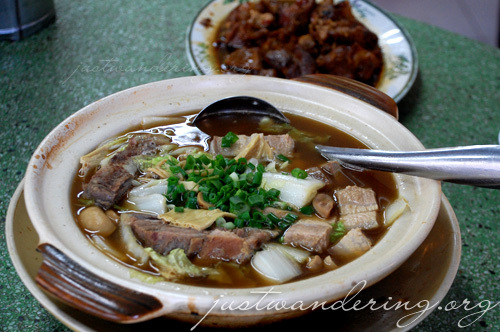 Bak kut teh is a hearty soup made with pork ribs and intestine swimming in herbed clear broth. Marie took us to Sun Fong Bak Kut Teh near Jalan Imbi. Like most soups, it’s a perfect for a rainy day or a comfort food after a long and tiring day. We also had the stewed pork, shrimp omelet, some sort of steamed fish and this yummy iceberg lettuce blanched and drizzled with yummy light sauce and topped with garlic. The following day, we had lunch at Nam Heong Restaurant inside Sungei Wang Mall. We had their specialty Hailam chicken rice, which was really oh so good. Chicken rice never cease to make me happy, but their other dishes made me happy as well: pork sandwich with yam, stewed pork (they cook it with vinegar, which makes it very reminiscent of humba), steamed bean curd with oyster sauce and bean sprouts with garlic. On our last night in Kuala Lumpur, we went to meet with the Tourism Malaysia people for dinner at Nasi Kandar Pelita. Just a stone’s throw away from the Petronas Twin Towers, this restaurant is a great food stop if you’re in KL. Nasi kandar is basically rice served with different dishes. In short, kanin at ulam. Several kinds of dishes are laid out and you pick whatever you want to go with your rice. Not into rice? Try their garlic naan, which comes with three different dips. 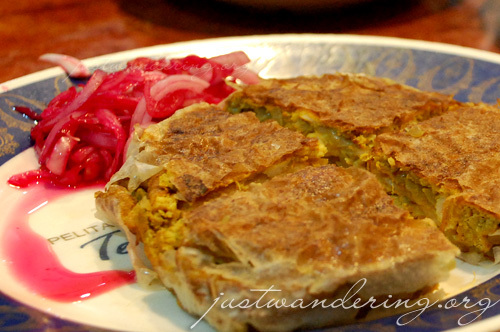 Or go for the murtabak, which you have to eat with the gravy and picked onion. Yum. Outside Kuala Lumpur, we had some memorable food stops as well. In Genting Highlands, we had lunch at the Penang Food Village at the Theme Park Hotel. Serving up dishes Penang is known for, I was able to have the asam laksa that I have been craving for. Marie also ordered a plate of fruit rojak for the group to share. It is made with fresh fruits and topped with a “dressing” made with a mix of water, belacan (shrimp paste), sugar, chili and lime juice. 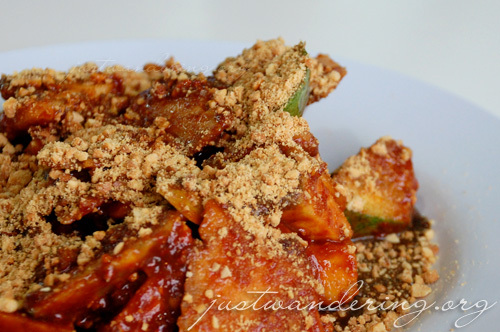 Ingredients of the rojak differ depending on where you have it or on the chef’s or hawker’s own recipe. When we spent Merdeka day in Malacca, we had a late lunch at the Seroni Nyonya Cuisine Restaurant. Nyonya or peranakan cuisine is the mixing of Chinese and Malay influences resulting in rich and flavorful dishes. We had lemak prawns, ginger venison, chicken tempra, anchovies with cili garam, fish fillet in tamarind sauce and the best stir fried okra we’ve ever had to go with the fried kampung rice. For dessert, we had the cendol, which was perfect match for the hot afternoon. Oh you went to Pelita! The murtabak pic is making me hungry. *Yummy yummy* Did they bring you guys to explore Jalan Alor? You like chicken rice mah? 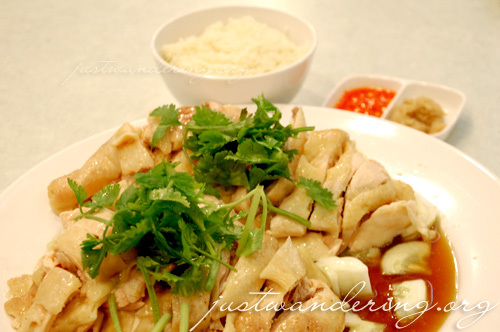 Dunno if you have tried Tian Tian Chicken Rice in Maxwell Food Center here in Singapore. The next time you are in the island, we will take you there!